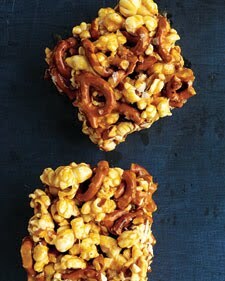 During one of our many snowstorms in January I made these caramel popcorn and pretzel bars. I am a sucker for caramel anything (caramel apples, caramel popcorn, salted caramel candies....). If it has caramel in it, then I am SURE I like it. My dad also loves caramel. These bars were a definite must-try when I saw the recipe in Everyday Food. And they were just as good as I had hoped. The boys and I delivered a couple to my mom and dad, snow storm and all. We geared up and trudged through the snow and enjoyed sharing these special treats. Coat a 9-by-13-inch baking dish with cooking spray. In a large bowl, toss together popcorn and pretzels. Great combination. These were sweet, salty and crunchy. Perfect snack or party food.